CHARLOTTE – Charlotte Fire Department firefighters were on scene of a house fire Wednesday afternoon on Bluestone Court at Cedarwild Road. One cat was rescued and revived on scene. 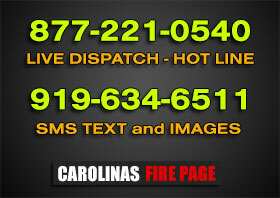 CHARLOTTE – Investigators believe they have determined what caused an overnight fire that destroyed a home in east Mecklenburg County early Friday morning. The fire started around 3 a.m. on Talus Trace Lane. A family of four was asleep at the time, but managed to get out safely. LELAND – A Brunswick County family needs a place to stay and a firefighter is recovering from injuries after a fire destroyed a home in the Magnolia Greens Community of Leland. WAKE FOREST – At about a quarter past eleven in the evening on Saturday night, April 12th, Wake Forest Fire Department and Rolesville Fire Department were called to 417 Cottesbrook Drive in Wake Forest. GREENSBORO – The Greensboro Police Department is investigating after a body was found inside a pawn shop following a fire earlier Monday morning. A large home also burned about the same time at a large home.